If you have a brilliant idea, the sad reality is that many people have probably already had it before you. It turns out this is also the case with less than brilliant ideas. For proof of this, one need look no further than the app store, with its plethora of fart apps. Even excluding the numerous soundboards that might include farts, or the multitude of fart-based games (a shocking number of which are knock-offs of Flappy Bird), there are dozens of apps whose sole purpose is producing fart noises. In such a crowded marketplace, how is the discerning consumer supposed to choose the program that best suits their doubtlessly mature, business-related purposes? Fortunately for flatulence enthusiasts, I have reviewed the thirty-nine free apps I could find, categorizing and compiling them into one comprehensive toot-orial (shout out James Joyce). 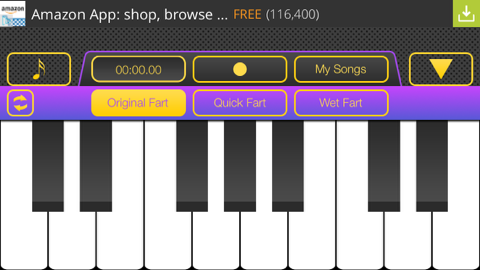 By far, the most popular subgenre of flatulence-based apps is the soundboard. The component parts of these apps are pretty similar, so a lot of it breaks down into interface. Apps such as Fart For Free, Push My Finger, Fart Machine and Fart Sound Generator opt for the simply numerical, “Fart 1, Fart 2, Fart 3,” etc. If that’s too complicated, there are also soundboards that indicate the various sounds by hue (All In One Fart Buttons), or picture (iFartPad). However, your really primo fart soundboards typically give colorful titles to their audio offerings. Whether it’s Tap & Fart’s straightforward options like “Two Tone Fart,” and “Airy Fart,” iFlatulator’s fanciful “Barn Burner” and “Juicy Fruit,” or iFart’s more viceral “Jack the Ripper,” and “Dirty Raoul,” names that stick in your head make it easier to remember the perfect toot for the perfect occasion. Steer clear of Fart Sound, whose ten noises are too polite for their own good. For sheer breadth, Post N Fart takes the cake with 91 unique sounds, from “Eggy Whiffo” to “Erm.” As with many of these apps, you can also email your selected fart to friends or former friends. And according to the app’s instructions, new updates appear regularly, so you’ll never run out of cheese-cutting goodness. If you’re a man of simpler tastes, though, the real winner is Bacon Farts. A cute strip of bacon with googly eyes and a removable mustache leads you through 27 sounds, including “Meat candy,” “Hickory,” and “Naked Bacon.” Bacon Farts also includes a “fart bender” that allows you to modulate the pitch of your flatus. 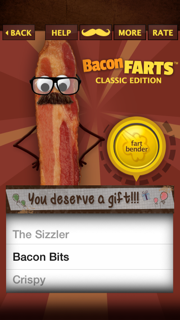 The app is simple and intuitive, and includes a Thanksgiving and Christmas mode with holiday-appropriate bacon outfits and fart names. 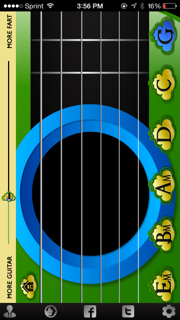 For those musically inclined, there are enough melodic options on the app store to form a wind-breaking band (although there’s an opening for a fart bassist). The most popular format is the keyboard. You can tickle the intenstinal ivories with the shoddy Fart Piano (Free) or the seemingly identical but superior quality Fart Piano Free. 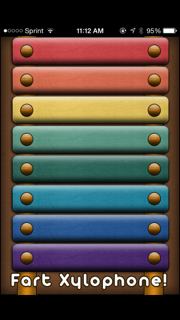 Equally barebones, though slightly more colorful, is Fart Xylophone. For those in search of more bells and whistles, Farthoven Lite provides four different flatulant keyboards and five prerecorded songs–you haven’t heard The Entertainer until you’ve heard it in the key of “cheek fart.” Unfortunately, all the notes sound more buzzy than anything else, meaning that the winner here is Burp and Fart Piano, which offers three fart keyboards and three burp keyboards with 17 keys apiece. On the drums, we’ve got Fart FREE Drums, which is unfortunately more a novelty than a musically viable app. On strings is Fart Guitar, both adaquately farty and adequately musical with the choice of accoustic or electric. Finally, there’s Fart Boxin’, which offers three sets of nine boomboxes. Alas, you can only play one note at a time, making this essentially useless (even more so than you’d think a beatboxing fart app would be). Worry not, there are farts aplenty for the merry pranksters amongst you. 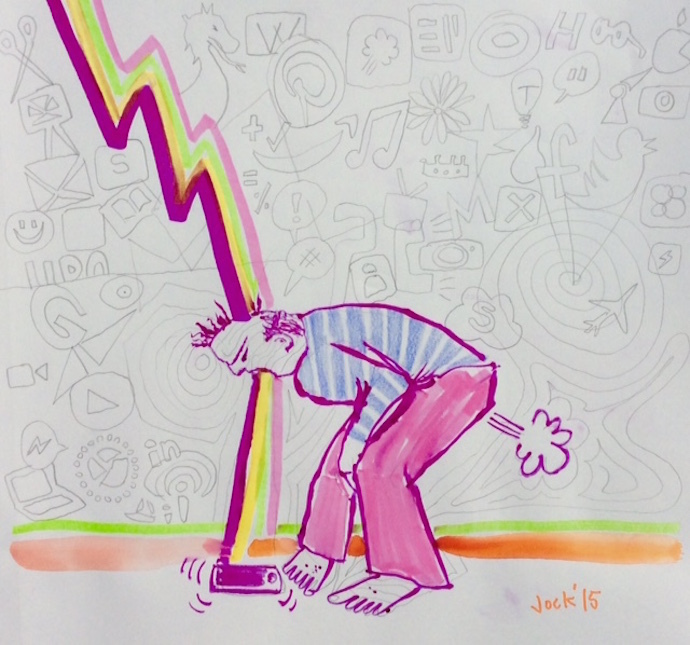 There are several apps designed for the age-old purpose of making it seem like someone has farted when they haven’t. Many of these apps utilize the familiar whoopie cushion format, and all of them have the same essential purpose. 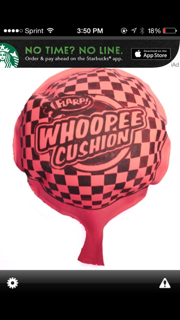 On the simple side is iWhoopieCushion, which entails touching the screen for a random fart noise, and Fart Cushion, Fart! 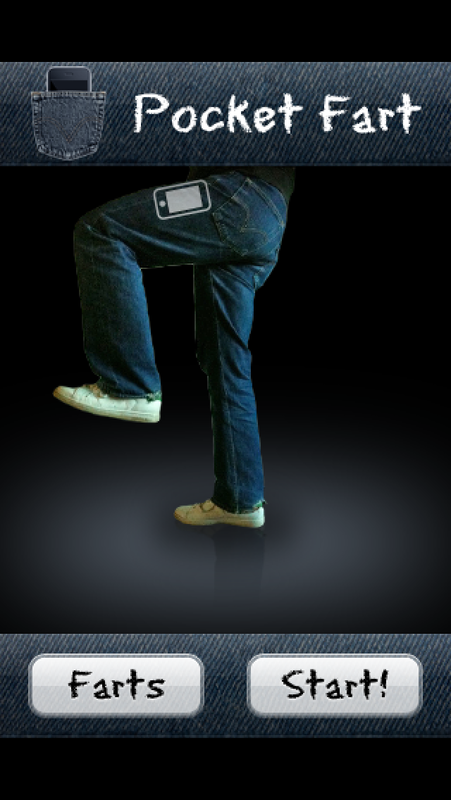 !, and Farty Pants Gas Prank, which go off when your phone moves. Pocket Fart offers the most dexterity, providing different rectal dispatches depending on how fast you move your leg. Whoopie Cushion 3000 seems impressive, with over fifty sounds available, yet for some reason only three of them are flatulent. This means the true champion is WhoopieCushion, which offers seven satisfactorily disgusting sounds and the option of a motion detector or timed farts. Avoid iWhoopee, which offers 12 noises that sound more like a rubber cushion than an actual gastronomic event. In reviewing these apps, I came across a few that don’t fit neatly into one of the above categories. 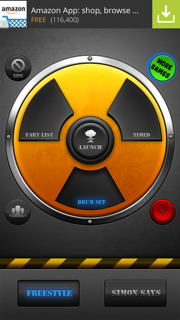 Fart Studio, for example, is a soundboard, but its focus seems to be on the variety of images–like fireball, poison spray, and poo piles–you can attach to the sounds. Burping, Farting, and Screams of Relief is also a soundboard of sorts, except every fart must be combined with a burp and relief noise. The truly bizarre Fart Whistle is kind of a whoopie cushion app, in that it’s motion-activated, but it comes with a whistling noise and it seems like there might be some abstruse gaming element to it. Then there’s Who Farted – Farty Pants, which is so choked by ads it’s impossible to understand; Fart Button, which is too buggy to play; and the intriguingly named Even Girls Fart, which tragically wouldn’t open on my phone. There are also a few suite apps. Fart ™ and Fart Sound Board appear to be the same app with different interfaces, and while they offer a variety of programs, they try to tackle too much and end up mastering nothing–their sound boards are limited and their piano just sounds buzzy. 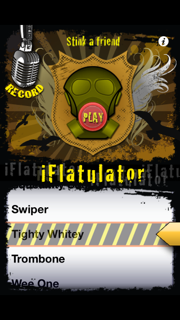 More successful is Atomic Fart, the only app that includes a game of fart Simon as well as a drumset that’s higher quality than any of the music apps. Finally, the completely uncategorizable: FartBox allows users to record and share farts, and offers a brand new fart every day, making it the most impressive app in many regards. And of course, there’s Instant Fart!, which is just a red button. 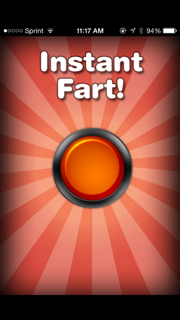 You press it, it makes a fart noise, and the app automatically closes. It’s ridiculously straightforward, but I have to admit it made me laugh more than any other app on this list. With fart apps as with so much of life, it’s all about the simple things. Matt Crowley is a writer and comedian living in Los Angeles.